With reference to Mark Twain, the report of print’s death is greatly exaggerated. Actually, print is a still a powerful and growing medium of communication even with the advent of the Internet. People still enjoy the touch of a personally addressed card or letter in the mail. There is still something more special about receiving something in the mail, being able to open it and hold it in your hand as opposed to reading it on a static website. Print was the way of distributing information for as long as most of us can remember. 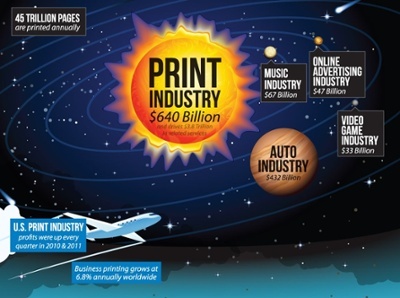 Today, print is still one of largest industries in the world. Print dwarfs the auto industry. Print generates 640 billion dollars in sales and 3.8 trillion in related services annually, while the auto industry creates a mere 432 billion a year. Did you know that direct mail is responsible for 78% of non-profit donations? Contrary to the perception of many, e-mail response was actually down 57% last year. Compare that with direct mail which was up 14%! What does this suggest about the use of print in marketing and communicating? Print engages. At Spectrum Printing, we devote ourselves each and every day to delivering that personal touch of providing print materials. We understand the importance of your project no matter how big or small. We value you.